When most of us think Cooler Master, we typically think PC cases and CPU coolers, and well, that’s because that’s what they do best. 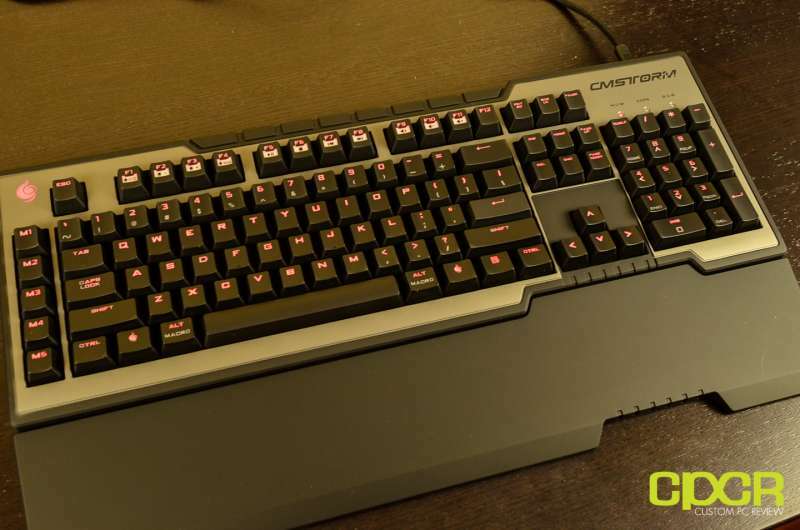 However, with Cooler Master’s relatively recent push of their gaming gear line, CM Storm, they’ve really expanded into many different markets previously unknown to the company. One such market is the gaming keyboard market, and if you’ve read our previous review on the Quick Fire Rapid, you’ll know that we were quite impressed with their first entry. Well, since our review of the Quick Fire Rapid, a couple months have gone by and Cooler Master has already announced and released two more mechanical keyboards which include the Quick Fire Pro and of course, the Trigger. 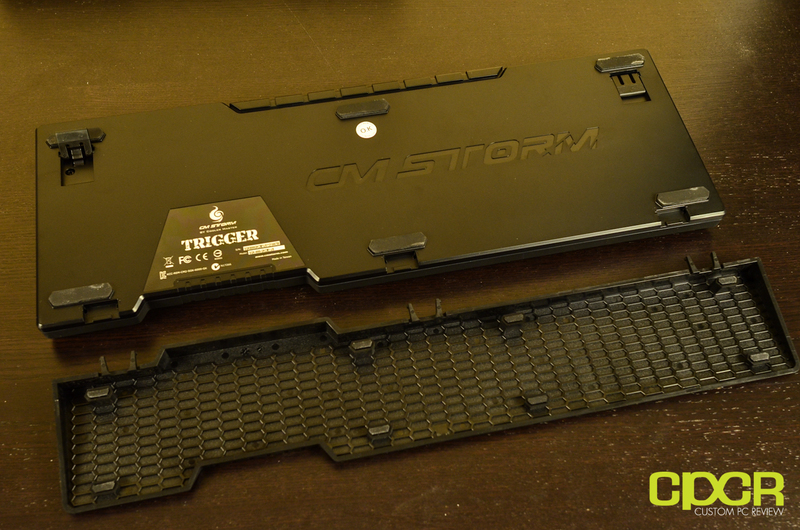 Today, we’ll be taking a look at the CM Storm Trigger, which is one of the newest additions to CM Storm’s line of mechanical keyboards. The keyboard features Cherry MX switches, crimson LED back lighting, 6 key rollover, 5 dedicated macro keys, media keys, gold plated cables, and a full speed USB 2.0 hub. As you can imagine, these features make the Trigger quite competitive on the market. One of the nice touches about CM Storm keyboards, is that they produce the keyboards in every different, common Cherry MX switch type out there so you can choose what you want depending on the feedback you desire. You can choose between Cherry MX Black, Blue, Red, or the one I have for you today, Brown. These switches vary in a couple major ways which include force required to actuate (actuation force), whether the keys make a sound when pressed down, and whether or not you will feel tactile feedback upon pressing a key. Still interested? 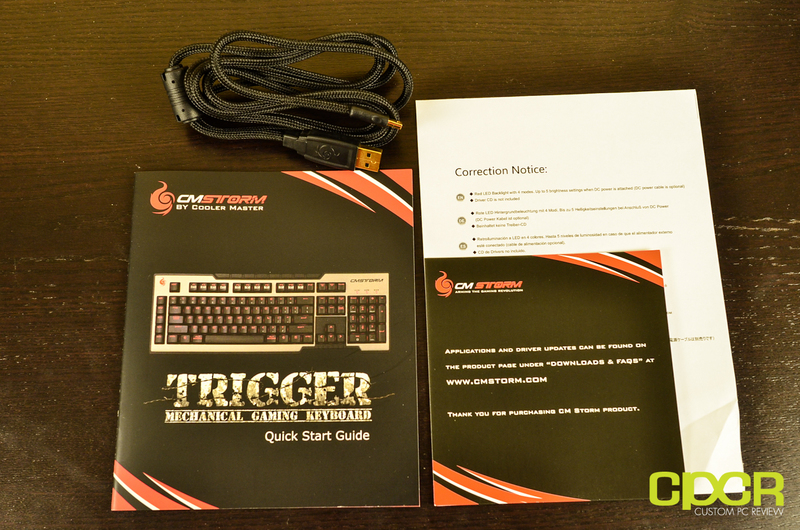 Lets take a deeper look at the features and specs of the CM Storm Trigger. Software is not included and no PS/2 adapter is included as well. This means that the keyboard only supports 6 key rollover. Additionally, software to take advantage of the keyboard’s profile/macro functionality, must be downloaded from Cooler Master’s website. 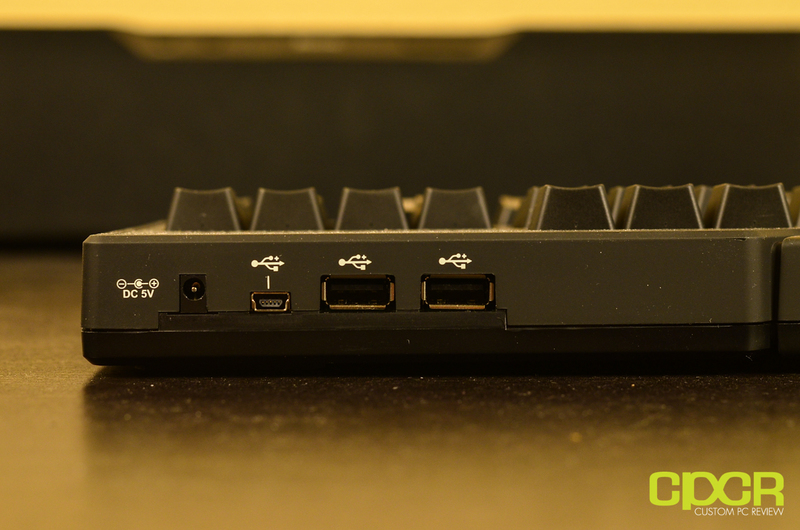 Here we’ve got a full view of the keyboard with the wrist rest attached. As stated earlier the construction and feel of the keyboard is superb and the non-slip rubber cover is helpful in intense gaming sessions. You can also see that the keyboard is the standard North American layout, so thankfully we wont have to deal with any extra backslashes and different sized shift/enter keys found on European keyboards. 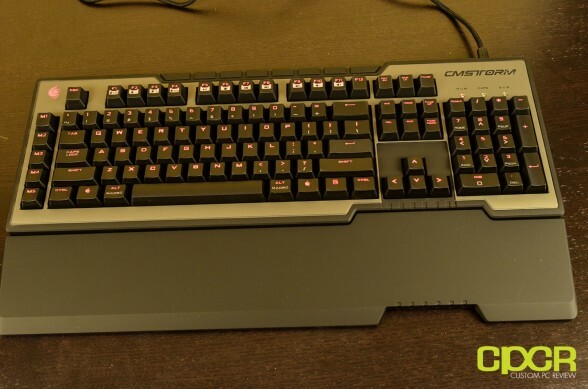 Taking a look at the bottom of the keyboard we find one of the best features Cooler Master has added and that all other companies should strive to achieve. What am I talking about you might ask? Well, let me tell you. The answer is the rubber feet. Most keyboards provide you with two to four tiny feet while Cooler Master has included a whooping 6 large sized feet that prevent all sorts of slipping and sliding. What’s even more awesome is that the wrist rest also includes an additional 8 rubber feet! Your keyboard is not going anywhere from where you left it. That is unless you pick it and move it. 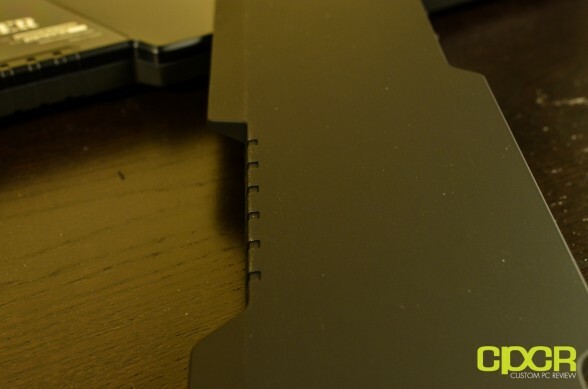 The keyboard also includes two stands that can help adjust the height of the keyboard to your liking. Whereas most companies would just drop in the plastic stand and be done with it, Cooler Master has gone the extra mile here to add a coat of rubber to ensure no slippage occurs even when using the stand. 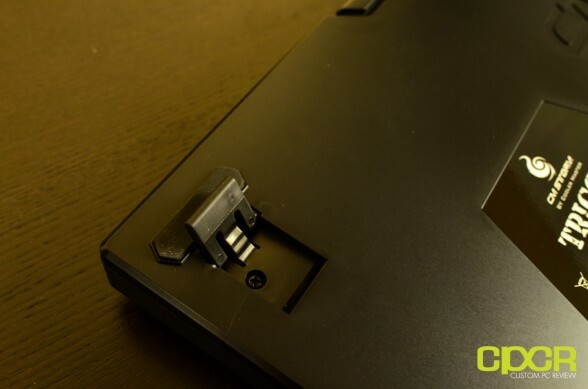 Around the back of the keyboard we see a mini USB that connects the 2 ft long gold USB cable to the PC. This is a great design choice as USB cords are much easier and much cheaper to replace than an entire keyboard. Since the USB cable is usually the weakest link, why not make it detachable, right? Next to it you also get two 5V USB ports for any extra peripherals you might want to add. However it becomes quite apparent that the USB ports have limited power and are not able to run peripherals that consume a lot of power. This is because the USB 2.0 spec has maximum power draw of only 500mA. While I’m not completely sure how many mA the keyboard itself draws, by assuming it draws around 300mA (Think power to the entire keyboard including the LEDs), that only leaves 200mA for both USB 2.0 ports. This is why some devices which require higher power draw won’t work. For example I was able to plug the Steel Series Diablo Headset just fine, but once the mouse was plugged an error message popped up saying that the USB HUB power was exceeded. The keyboard was also not able to power a USB flash drive i had lying around, so forget about even trying to plug USB powered hard drives into these USB ports. That is unless you purchase an external power adapter that plugs into the port next to the mini USB connector, which if connected will not only give the USB 2.0 ports full power, but will also be able to give the keyboard two additional (I’m assuming brighter) LED settings. Wow, what a great feature! Unfortunately, the aforementioned adapter is not included. What a total buzzkill. As you can see here, the Windows key is replaced with a custom CMStorm keycap, but I’d like to report that Windows key functionality still exists. 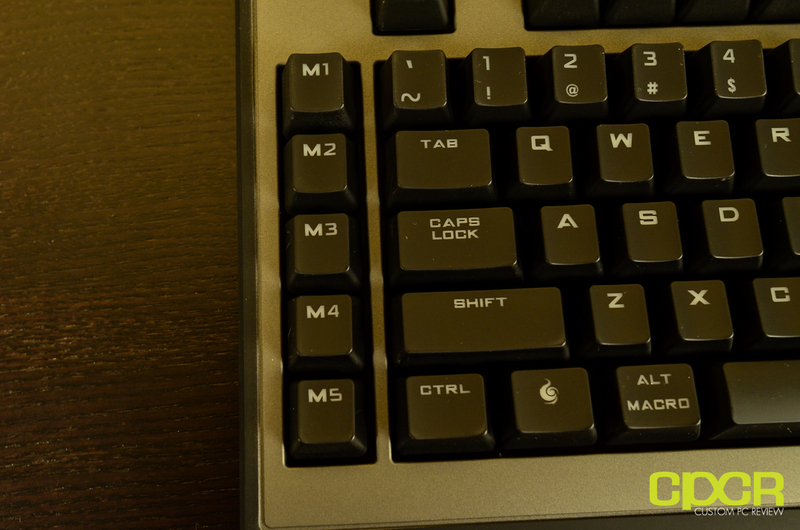 To the side of the keyboard you will see 5 macro profile switches labeled M1 through M5. These keys do not work off the bat but once the Trigger software has been installed you will be able to preset all kinds of fun stuff for these buttons. A small issue i had at the beginning was actually caused by my muscle memory. Being so used to standard keyboards without the macro keys my left finger would shoot the the bottom left most key thinking that i was hitting the CTRL key while in reality it was pressing on M5. 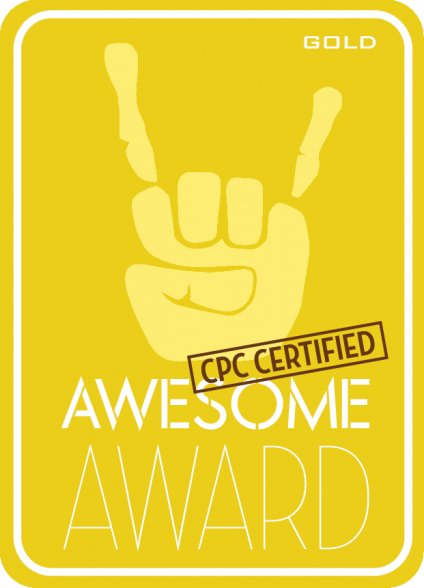 As a result there was some initial confusion for why stuff was not being copied or pasted. This issue was easily fixed after my fingers adjusted to the layout of the keyboard. 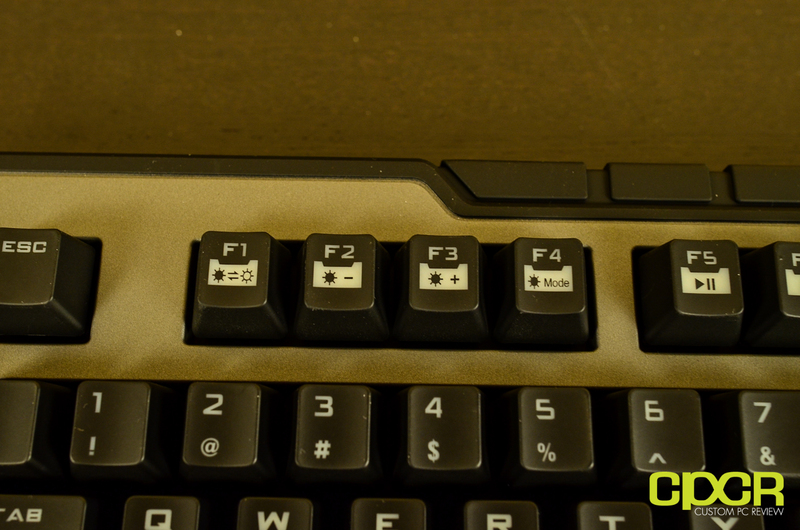 From F5 to F11 we get some media keys as well. I’d definitely like to see some dedicated media keys, but I’ll take what I can get. To access these keys, simply press the CMStorm custom key (normally windows key) and the desired media key to have the desired effect on screen. 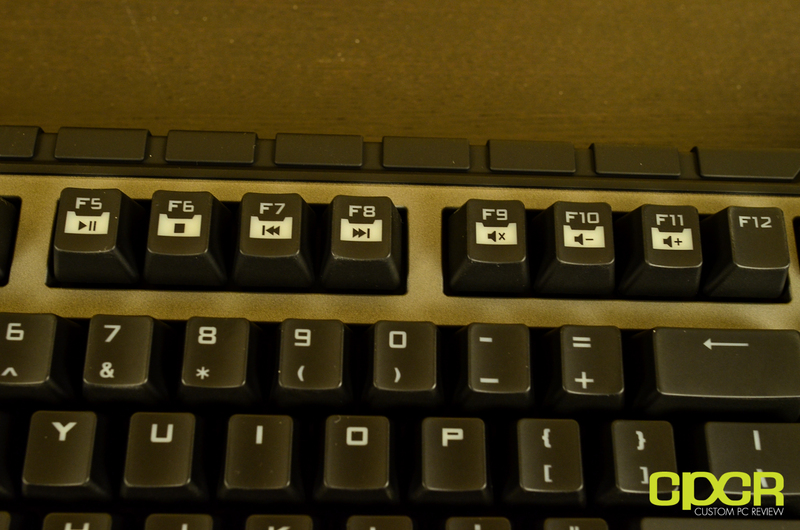 The F1 through F4 keys allow you to adjust the keyboard lighting to your desire. You can choose from turning the LED’s completely off, lowering the intensity or changing modes. The pictures on the keys should be self explanatory. Removing a couple keycaps off the CM Storm Trigger, we can see that every single key on the keyboard has both its own LED as well as a Cherry MX Brown mechanical keyswitch underneath. 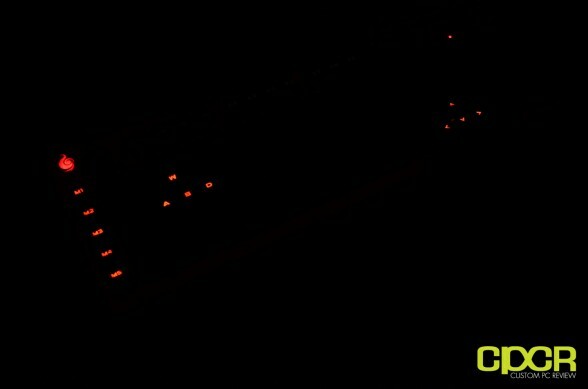 LED modes include 2 intensity levels for the keys (2 more with the external adapter), and a mode where the WASD, the arrow keys, and the macro keys are left lit while the rest of the keyboard is off. 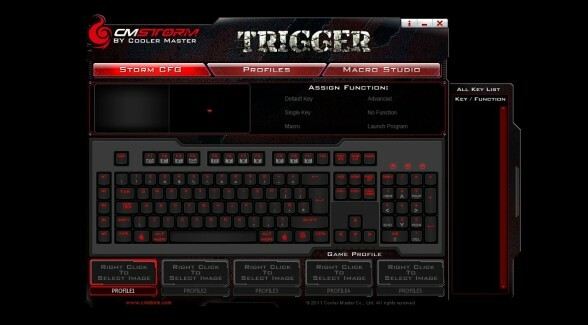 CM Storm Trigger in the dark. 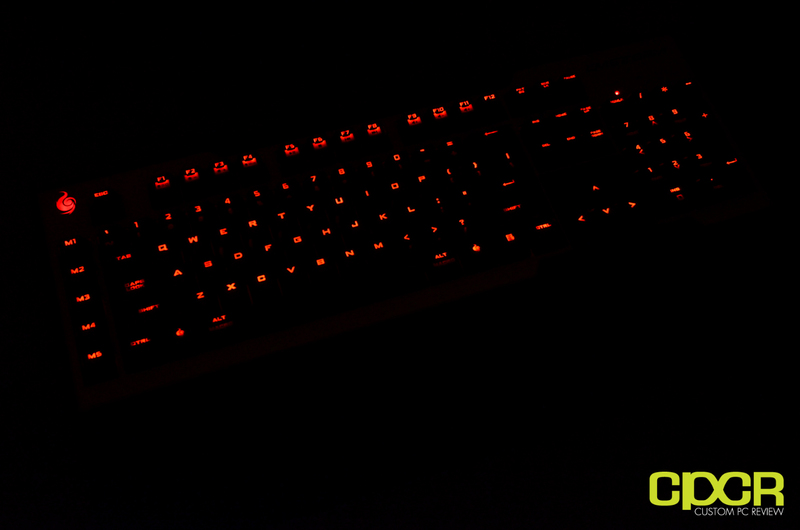 Cooler Master has done a fantastic job with the lighting as it’s quite bright and quite evenly lit. For some reason the picture above didn’t come out quite right as some keys appear brighter than others, but I assure you the keyboard looks great in person. Test 1: Left 4 Dead 2. Starting with an FPS (First Person Shooter), I really wanted to find out whether 6 key rollover would be a limitation as multiple key combinations need to be pressed when strafing and crouching simultaneously. Overall, I didn’t have any issues playing the game as the key presses where quite responsive and I saw absolutely no ghosting. Additionally, since I was using an old OEM keyboard, by switching to the Trigger, having the ability to disable the Windows key definitely came in handy. I’m happy to say that I finally got rid of the occasional but quite annoying accidental press that would minimize my screen causing the audio or video to glitch out. After all I need to be able hear the terrifying cries of the witch before I accidentally set her off on me resulting on her ripping my guts to pieces. Test 2: Star Craft 2. The performance here was flawless. Keys were very responsive even when I was micro-ing my Protoss army against an angry Zerg swarm. Of course, based off my fail APM, I don’t think I’m a very good tester for this. That said, plenty of professional Starcraft players use Cherry MX Brown mechanical keyboards. During this test is where I saw minor performance hiccups from the keyboard. The fighting games while playing on single player mode were good and I had no issues performing Hadoukens and calling out for assists. The issues arose when a second player was introduced. Once my buddy and I started slamming onto all the keys, the 6 key roll over became a small issue. Some moves would not register and we also encountered issues when we both tried to simultaneously do a super move. Having heard that mechanical keyboards could improve your typing speed, I decided to put that to a test. In order to conduct my testing, I used this touch typing test site and proceeded to perform a typing test with my laptop’s keyboard (Dell Studio XPS 13, possibly the worst case scenario) followed by a new test using the CM Storm Trigger. So that the results would be accurate I performed these tests 3 times and the results are below. If you want to know how fast you type try it out for yourself after you have finished reading this review. As you can see above from my ultra, highly scientific test, my typing speed has improved by 10%. Of course, I’m still getting used to this keyboard and I’m definitely typing faster and faster every day. 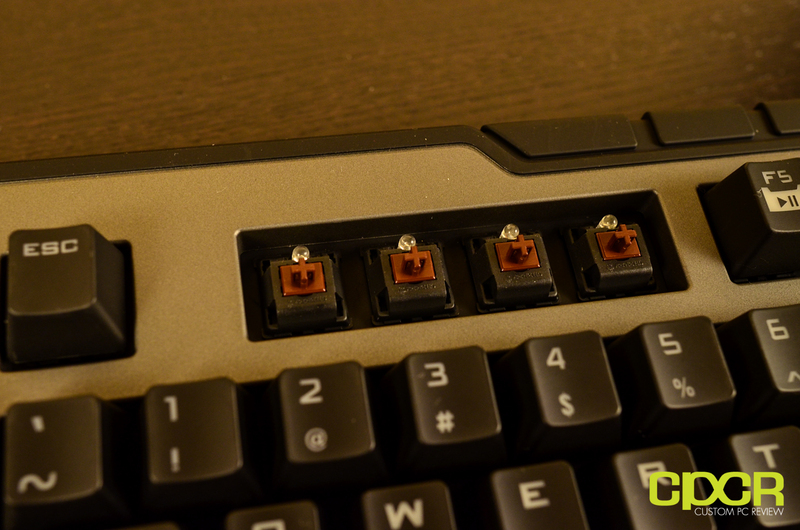 From my experience, the CM Storm Trigger’s Cherry MX Brown switches feel great and are comparable with those found on Das Keyboard Model S Professional Silent and the Max Keyboard Nighthawk X8. After all, they’re all Cherry MX Brown at the end of the day. If you’re really, truly interested in improving your typing speed I would definitely recommend getting a keyboard with Cherry MX Blue or Brown switches such as the Trigger, Das Keyboard Model S Professional Silent, or the Max Keyboard Nighthawk X8. The difference is that the Cherry MX Blues and Cherry MX Browns both offer tactile feedback while the Cherry MX Blues additionally also offer auditory feedback as well. To test key rollover i will be mainly focused on slamming the ASDFJKL; keys in different combinations. After constantly mashing my test set of keys, I found that the keyboard can indeed handle 6 key presses simultaneously without a glitch however once you try 7 keys, either a subset of those keys show up or nothing at all. As you can see from the image above the software is very minimal and very easy to use. You can go to the macro studio tab and either choose a preset macro or record your own. Once that is done you can go back and assign it to the desired keys and save it to desired profile. Beginning with the keyboard’s perfomrance, I’m going to go out there and say I’m very impressed. Being a gaming keyboard, I found gaming performance was for the most part quite good in FPS and RTS games, but I did find it a bit lacking for fighting games. With many of the keyboards we’re seeing pack full N-key rollover or even just 20 key rollover, the 6 key rollover included on the Trigger seems a bit paltry at best. As far as typing perfomrance, I was definitely amazed when switching from my laptop’s keyboard over to the Trigger. Through my testing, I found that I was able to improve my typing speed by approximately 10% despite the fact that I’m still getting used to using mechanical switches. I absolutely love the tactile feedback from the keyboard coming from the MX Brown switches and I don’t think I’ll be switching to anything else anytime soon. The crimson colored LED keys are a great touch as well and they look quite amazing especially paired with peripherals like the SteelSeries Diablo Headset and Mouse which also glow a crimson red. The on board memory allows for you to save the brightness intensity to your liking and it will not reset to a default once the computer is shut off like some keyboards such as the Mionix Zibal 60. 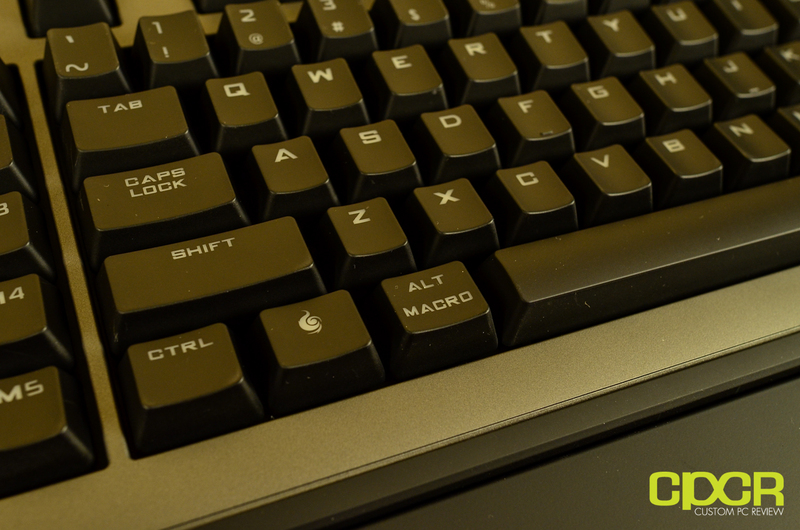 5 dedicated macro keys are available for people who desire to use them. The fact that they are dedicated allows for faster access to macros which is an advantage over many awesome keyboards that are lacking these feature. The software to program them is relatively easy to use and a preset macro can be chosen or a new one recorded. I personally had some issues at the beginning with the placement of the keys at the lower left since my muscle memory would tell my finger that the lower left most key was the CTRL key instead of the M5 key. This however was easily overcome and I am no longer experiencing this issues. As far as problems, I might just be nit picky here with this but the one draw back I found was not having enough power run through the USB ports. I was super excited to see 2 full speed USB 2.0 slots since my laptop only has 2 ports on board. When I got the keyboard I was thrilled to be able to have access to a third port; however with the power limitations meant that I was not successful when plugging in many different things. For example with the USB based SteelSeries Diablo headset and mouse, I was able to use the USB port for either the mouse or headset but not for both. Also for some odd reason, I was unable to read a simple USB flash drive and my phone. This is not a huge, huge deal since a DC adapter may be purchased giving the USB ports full functionality and you also get 2 more light intensities with the LED backlighting to boot. My only wish is that this adapter came stock with the keyboard. The CM Storm Trigger is currently available at Amazon for $119.99, which is actually a competitive price for a keyboard with so many features. Competitors include the Razer Blackwidow Ultimate ($113.99), Corsair Vengeance K90 ($111.99), and the Max Keyboard Nighthawk X8 ($144.99). 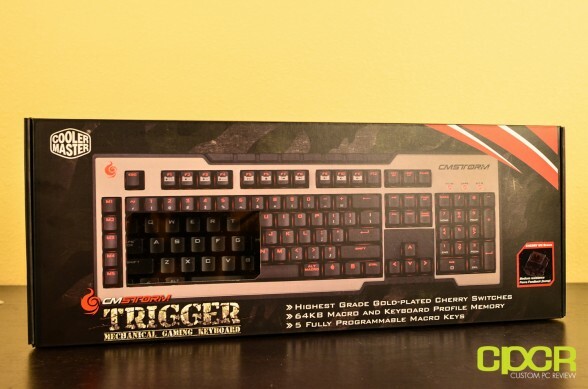 The CM Storm Trigger Mechanical Gaming Keyboard is the first mechanical keyboard that i have had the chance to extensively test and I have to admit, while at first I was a bit skeptical, I’m now a big believer in mechanical keyboards. After some long term testing of one, I’m very happy to report that it indeed does make a difference. In fact, I’m going to have quite a hard time going back to one of those cheap membrane keyboards now. Considering price, durability, performance and features, the CM Storm Trigger is an extremely competitive product and is highly recommended to anyone looking for a fantastic mechanical keyboard that’ll not only help improve your work, but your game as well. Special thanks to Cooler Master for making this review possible. The Cooler Master CM Storm Trigger Mechanical Gaming Keyboard is currently available on Amazon. After further having the opportunity to speak with Cooler Master, it has been brought to my attention that the USB ports can be fully functional and fully powered if the keyboard is plugged into a USB 3.0 port. Whereas USB 2.0 ports are limited to 500mA, USB 3.0 ports can deliver up to 900mA per port while some higher end boards like those offered by Gigabyte with its USB 3.0 power boost can deliver as much as 1500mA! Because of this increased current, you will be allowed to charge power hungry devices such as tablets and cellphones at full power. Of course, we were quite intrigued by this claim and decided to test this for ourselves. After plugging the Trigger into a USB 3.0 port, I am happy to say that everything I plugged did indeed work. Whereas previously I was unable to power both my USB mouse and USB headset when the Trigger was plugged into the USB 2.0 port on my computer, I no longer had this issue when the keyboard was plugged into a USB 3.0 port. 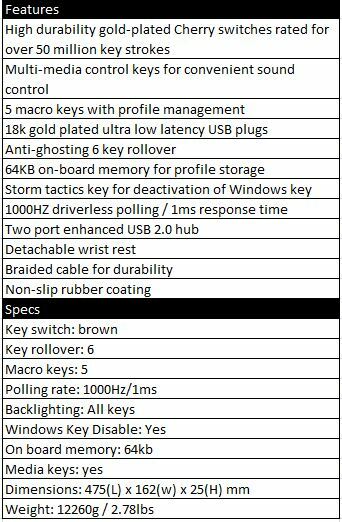 That said, with the growing popularity of USB 3.0 as it is now standard with Ivy Bridge processors and the Z77 chipset, I believe under-powered USB ports may no longer be an issue on this keyboard in the future.